Who can resist the occasional cannonball? Dish up family favorites, and be sure to ask staffers about local hotspots for a night or two out. Vacation schedules (or the lack thereof) mean more you-time at the gym. Set up camp under some umbrellas on the beach and stay as long as you like. Opt for the sofa or grab chairs on your private balcony - either works great. You're on a wide, private stretch of Myrtle Beach – perfect for paddle-ball and sand castle building. Located in a quiet area of Myrtle Beach, enjoy the peaceful seclusion. The Children's Museum is just a 9 minute walk, and you can get to the weird exhibits at Ripley's Odditorium in 17. The sparkling Atlantic is the star of the show here at the oceanfront Schooner II Beach and Racquet Club. Split your time between the beach and the courts (skewing way more toward the beach, truth be told). Stretch out under a brightly-colored umbrella and fly through that thriller you picked up at the airport, pausing occasionally to consult on the sand castle construction project underway a few feet from your chair. Lunchtime? Head back to grab some fruit and the sandwiches you made earlier, and find a spot to picnic. The outdoor pool makes an easy stop-off on your way back to the beach – or save it for another day. Help the kids with kites or see how long you can rally at paddle-ball on the sand before heading to your suite to figure out dinner. (Frozen entrees save the day.) Thinking ahead to morning, psych yourself up for an early stop at the fitness center, or schedule a tennis or racquetball match – post-coffee, of course. Spacious, comfortable one- and two-bedroom suites make your family feel right at home. There’s a king-size bed in the master, and jetted tub in the master bath – if you can find time for a soak. Fully equipped kitchens are well appointed with granite countertops and all the essentials for easy meals in (or out on your balcony, if the weather’s just right). After dinner, see if you’ve got any takers for a trip to the outdoor hot tub. Then later, sprawl out in the living room and pop in a Harry Potter DVD. If enough people doze off, declare intermission (aka bedtime) and finish it another night. 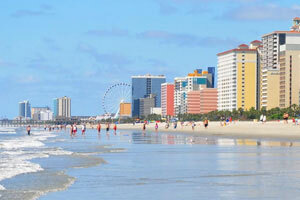 Myrtle Beach is an easy walk, and dining and entertainment options abound. Ask the front desk for guest favorites and insider tips on the best tables in town. Book a tee-time or two on the local courses, and hit the elaborate mini golf courses like Captain Hook’s, Dragon’s Lair or the oceanfront Shark Attack with the kids. Don’t miss the Myrtle Beach biggies, like Family Kingdom Amusement Park, Myrtle Waves Water Park and NASCAR Speed Park – or indoor options like Ripley’s Believe It Or Not Museum or the local aquarium.